I was very excited as I passed through the doorway and into the Cenacle (which means "dining room"). This is where where Jesus gathered His disciples to share His last supper to celebrate the Passover. It is where He was before He was arrested in the Garden of Gethsemane. It was at the last supper when Jesus broke His bread and told His disciples to break their bread and drink their wine as a representation of His flesh and blood to commemorate Him during the last supper. It was here the disciples stayed when they were in Jerusalem and it was here, before the last supper when Jesus washed the feet of His disciples. 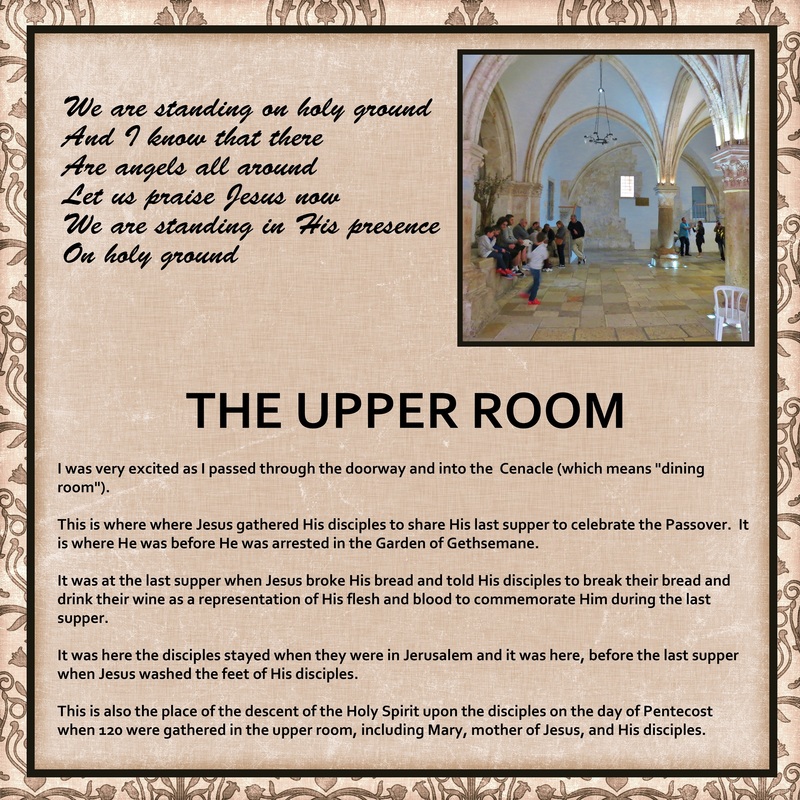 This is also the place of the descent of the Holy Spirit upon the disciples on the day of Pentecost when 120 were gathered in the upper room, including Mary, mother of Jesus, and His disciples. The top part are the words to "We Are Standing on Holy Ground". The lyrics are really nice here. Wow that is a beautiful place. The lyrics are a nice touch. Your journaling does a good job of showing how important this place was to you. I have goosebumps reading the journaling. What an incredible experience! good idea to add lyrics on here. I'm speechless. One word...Incredible. The whole LO is perfect from the song to story telling. Your LO has filled me with emotion.